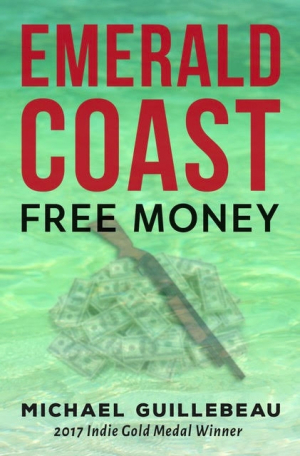 Emerald Coast is a freewheeling Florida mystery from Michael Guillebeau. Musician Lizzie Borden (not of family-killing fame) needs wads of money to buy back her songs and stage name, which are being held hostage by her record company. While cleaning hotel rooms, she comes across a bag of bills: problem solved. Except it’s beside a murdered mobster. She secretly takes the cash, hoping she can keep it but knowing she can’t. As if her burgeoning romantic relationship with Terry, the detective who is working the case, isn’t enough to tell her that. From its gripping opening paragraph on, the story skates along, full of dense, rich language reminiscent of Florida’s Emerald Coast itself. Scenes are set with a thick atmosphere of weathered words, and the book’s narration and vocabulary are edgy and fun, with raunchiness and innuendo. Characters are intensely inhabited—down to Lizzie’s head, itchy from a wig that covers her rocker hair. Menacing verbs and apt but sarcastic adjectives form satisfying combinations. Rhythmic, musical sentences penetrate the book, from the jazz-like, old-time gumshoe detective narrative flow to the original songs that come to Lizzie as she works. These contribute to a rapid read on Florida’s gator-filled waters. Music unites the land and the characters. The characters are as gritty as the sand surrounding the hotel where Lizzie works. Her evocative name and its associations prove true to her tough personality. Her despair and her determination show through in the language of, of all things, fishing. The reeling, slipping, gasping fish echo her dilemma: what to do with the two million dollars she has stolen but now can’t find a way to spend without giving herself away, and how to regain her music and her soul without endangering herself and others. Mixing intrigue with a dash of romance, Emerald Coast is an immersive read.